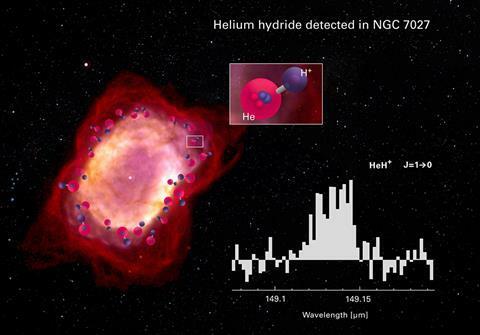 Despite the helium hydride ion HeH+ first appearing 13.8 billion years ago, following the big bang, from humanity’s perspective it had been lost in space. Hydrogen and helium were the two first elements, and in the universe’s extreme birth conditions astrochemists presumed they formed the first ever molecular bond in HeH+.. Rolf Güsten from the Max Planck Institute for Radioastronomy in Germany, and colleagues knew HeH+ can exist – it was spotted in the lab in 1925. But now, they have convincingly spied it in space for the first time, in a nebula that exists in the current universe. Güsten and colleagues observed the HeH+ rotational ground state in a planetary nebula using a terahertz (THz) spectrometer flying on the airborne Stratospheric Observatory for Infrared Astronomy (Sofia). In fact, this study is one of the reasons why the German Receiver for Astronomy at Terahertz Frequencies instrument was built. Scientists previously failed to find vibrational infrared spectroscopy evidence for HeH+ despite great effort. Terahertz spectrometry is a difficult alternative. The HeH+ rotational ground state has a wavelength of 149.137µm. Ozone and water in Earth’s atmosphere block out all this light, meaning researchers had to take to the stratosphere. Meanwhile, spectroscopic features from much more common carbon–hydrogen bonds appear at 149.09µm and 149.39µm. Success therefore required high spectral resolution, and very sensitive sensors, as Güsten’s team expected the signal to be weak. Reaching the 2THz frequency range of the 149.137µm signal also ‘took several years of technological advancements’. ‘This is a great first detection of a molecular species that is certainly of interest and relevance to a wider astronomical community, and this detection opens the door for further studies,’ comments astronomer Jan Cami from the University of Western Ontario, Canada. For example, Güsten and colleagues will search for more HeH+ when Sofia next flies, in June. But now they know HeH+ exists, they can start looking for it further back in time towards the big bang. They will exploit cosmological redshifts, similar to how wavelengths emitted by objects moving away from observers expand in the Doppler shift. That will multiply the HeH+ wavelength approximately tenfold, he explains, making the light from the young universe visible ‘from large ground-based observatories’, Güsten says.